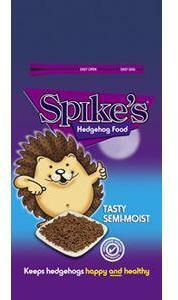 Spike's Tasty Semi-Moist dinner 650g Hedgehog hospital approved semi-moist food that keeps hedgehogs happy & healthy. It's packed with delicious and nutritious chicken and is suitable for hedgehogs of all ages. Great on its own or mixed with other foods from our range. Fed regularly it will encourage hedgehogs to visit your garden all year round. Spike’s Hedgehog Food is a naturally nutritious range of food for hedgehogs. Feeding the Spikesworld range gives hedgehogs all the vitamins and minerals to keep your garden hedgehogs happy and healthy. Providing extra care for them is particularly important as they try to store up enough reserves of fat to see them through the winter months.